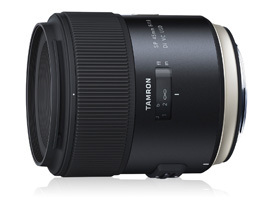 When Tamron introduced a new 35mm f/1.8 model complete with stabilization, the company also announced a 45mm version. The focal length provides a slightly wider field of view than the traditional 50mm, but with a ring-type sonic AF motor with rear focusing and a floating system, this is a sophisticated optical design — far beyond the typical standard 50mm f/1.8 models. 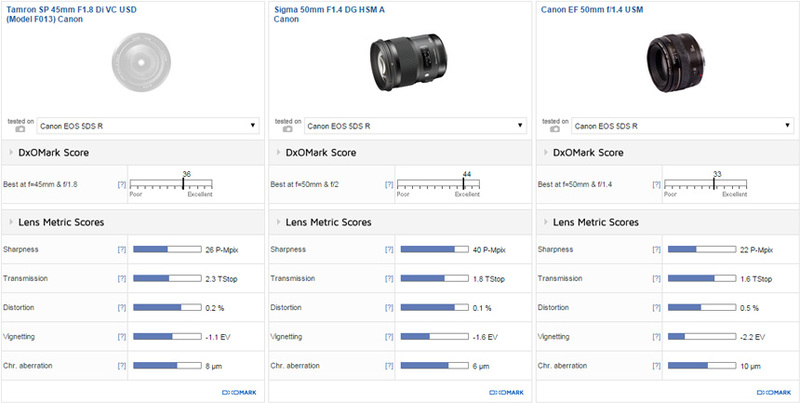 Lens construction consists of10 elements in 8 groups, which include two aspherical lenses to reduce coma and spherical aberrations for increased sharpness and clarity at wider apertures. 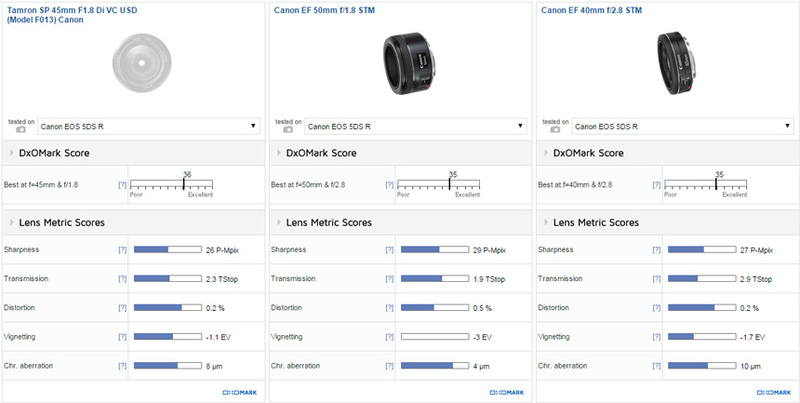 Although the 45mm omits the XLD (eXtra Low Dispersion) element found in the 35mm, it adopts one LD (Low Dispersion) lens to minimize residual color fringing. In addition, the lens adopts the company’s eBAND and BBAR coatings to suppress flare and ghosting for an increase in contrast and color fidelity. The lens is weather-sealed and features a fluorine coating on the front element to repel water and to aid cleaning of greasy smudges and fingerprints. The new Tamron SP 45mm F1.8 Di VC USD (Model F013) Canon-mount focuses to an unusually close 11″ (30 cm) and measures 3.17 x 3.60″ (80.4 x 91.4 mm). It has a 67mm filter thread and weighs 1.2 lb (544g). The new lens is available now for $599.00 (USD). Mounted on the 50-Mpix Canon EOS 5Ds R, the Tamron SP 45mm F1.8 Di VC USD (Model F013) Canon is an excellent performer. 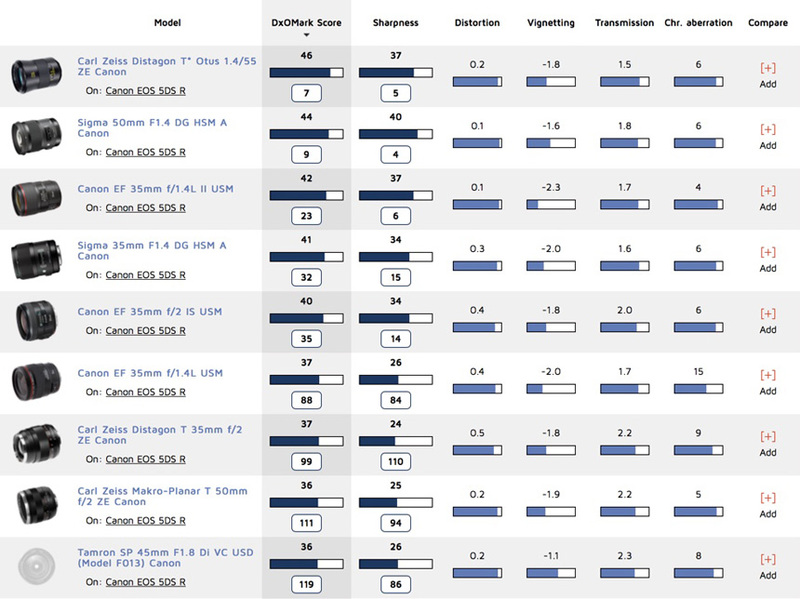 It achieved a DxO Mark lens score of 36 points and a peak sharpness of 26 P-Mpix (at the optimal aperture). This a little lower than the 35mm f/1.8 model when mounted on the Nikon D810 — a somewhat surprising result, given the Canon sensor’s higher pixel count, but the two optical systems can’t be compared directly (we’ve yet to test the 35mm f/1.8 on the Canon EOS 5Ds R). Nevertheless, the Tamron performs very well indeed, even if it’s some ways behind the 1.4/55 Otus and the Sigma 50mm f1.4 Art, and looks to be slightly behind its 35mm sibling. 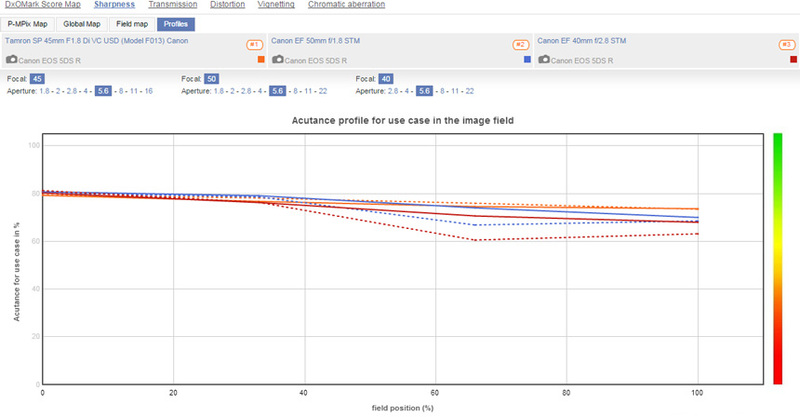 As we mentioned previously, the 45mm focal length is relatively uncommon, at least in Canon mount. Canon makes a TS-E 45mm f/2.8 tilt and shift model, but as a specialized lens, it’s not a rival to the Tamron. Compared with the accessibly-priced EF 50mm f1.8 STM, the Tamron isn’t quite as sharp at its optimal setting, nor is it as fast, with the Tamron measured at T2.3 against the T1.9 of the 50mm. Chromatic aberration is also a little higher; however, the Tamron has lower distortion and vignetting at maximum aperture. The EF 40mm f2.8 STM is another relatively affordable model that, like the 50mm, is aimed at a slightly different market, though they’re competitive in performance. The 40mm f2.8 might not be the brightest of the three, but it’s an excellent performer, even if it can’t match the sharpness in the outer field. Like the Tamron, however, it has relatively low distortion and fringing, even if does have quite high levels of astigmatism (which most likely account for its attractive rendering). The Tamron has excellent sharpness wide-open. The Tamron is sharper in the outer field and has no appreciable astigmatism, unlike the Canon EF 40mm f2.8. A high-speed model such as Sigma’s relatively new 50mm f1.4 DG HSM Art is pricier at around $949, while Canon’s EF 50mm f1.4 USM is also a contender — and at $385, is much more accessible. The Sigma is sharper at wider apertures up to f/2.8, and so has slightly better sharpness in the outer field. Remarkably the Sigma nudges 40 P-Mpix at its sharpest at around f/2.8-4.0, compared with the 26 P-Mpix peak of the Tamron, which is no real criticism of the latter. The much older, often maligned Canon EF 50mm f1.4 is still in fact a pretty decent lens, at least when stopped down to f/2.8 and beyond. It is not as sharp in the periphery as the Tamron, and nowhere is that more obvious than those apertures wider than f/2.8. But it’s not far behind the Tamron at f/4, and at f/8, all three perform similarly from the center right out to the corners. 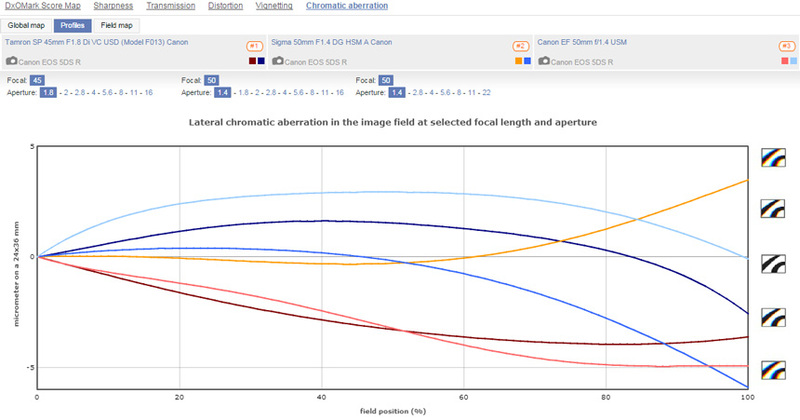 Chromatic aberration is more of an issue, however, with the Canon revealing its age more here than anywhere else. The film-era Canon has very high levels of CA at f/1.4, but while the Tamron has generally low levels, it’s not as well corrected as the Sigma. The Tamron performs well at f/2.8, but the Sigma is notably sharper. Although not quite at the levels of the faster Canon, the Tamron has quite high chromatic aberration across the field at f/1.8. The Tamron 45mm f1.8 is an impressive performer, albeit perhaps with not quite the resolution of its 35mm sibling. In addition, as a standard focal length, it is up against a number of equally impressive rivals, some of which are more accessibly-priced. Be that as it may, the Tamron can be used at any aperture knowing that it has good sharpness, particularly in the outer field, where more affordable rivals are often weak. At the other end of the scale, it can’t match the Sigma 50mm f1.4 Art lens. The Sigma has appreciably higher sharpness levels at wider apertures, but the Tamron is more affordable and the built-in stabilization goes some way to make up the difference in lens speed. With a good balance between build, performance, and price, it definitely shouldn’t be overlooked.